The CCCEPA Vocal Music Department offers a comprehensive music education in five graded choirs/classes and through almost limitless extra-curricular performance opportunities. Students are prepared to continue their studies at music conservatories, to major in music at a university, or to perform professionally. Vocal majors and minors receive preparation in vocal technique, sight singing, piano, music theory, and music history. Many of the magnet students study voice privately as well. CCCEPA is always well represented at Solo and Ensemble Festival, Large Group Performance Evaluation, the Governor’s Honors Program, and All-State Chorus. CCCEPA choirs have been selected to perform at in-service conferences of the Georgia Music Educators Association and the American Choral Directors Association. CCCEPA choirs have been featured at New York’s Carnegie Hall, Harvard University, and on “From The Top” on National Public Radio. Graduates of the Vocal Music Department are pursuing successful careers in opera, musical theatre, arts education, composition, and conducting. 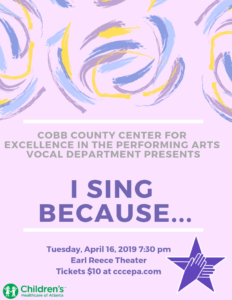 SPRING VOCAL CONCERT: "I SING BECAUSE..."
The CCCEPA Vocal Department presents the Spring Vocal Concert: "I Sing Because..." on Tuesday, April 16 at 7:30PM in the Reece Performing Arts Theatre on the Pebblebrook campus. The performance will feature all CCCEPA vocal majors and minors.